Lisaleh, who has been very consistent with her postings, has hurt herself in the kitchen and can’t craft so well right now. Go visit her anyhow and give her some get-well wishes. Yup, I built it in about 3 hours. The final costs: $45 for lumber and screws, $25 for childcare (I did some of it on the weekend when my parents had the kids, otherwise the cost would be closer to $45), $16 for fabric and $20 for foam and batting (on sale). So that brings us to… $106. Oh, and I’m not counting the gazillion staples I used, since they’ve been in the house for a while. You know, I could buy cloud decals for about $50. But I could also just go to Canadian Tire and buy white vinyl shelf paper (repositionable, of course) and then cut out my own clouds… for $5. Since I’m a cheapskate, that’s what I’m gonna do this week. 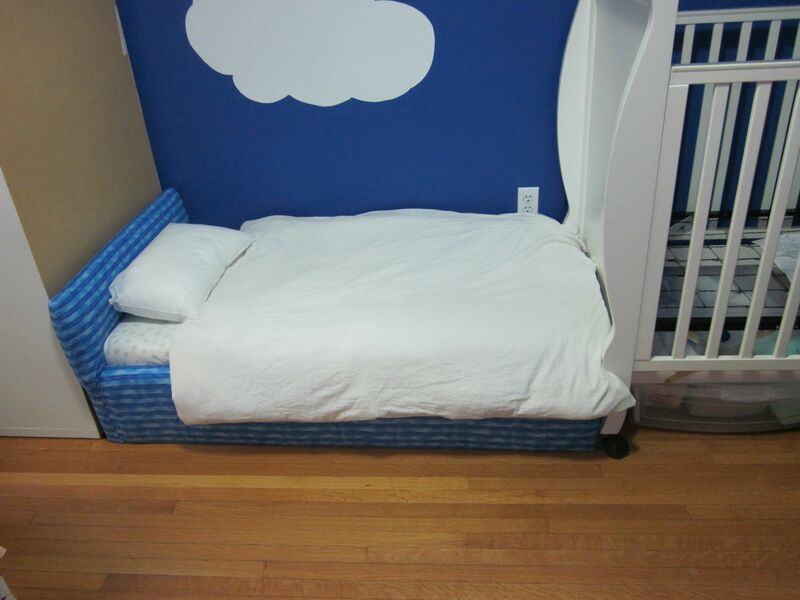 You can see a prototype cloud in the picture of N’s bed. Soon the whole room will look like the sky, and the white clouds will reflect more light than the blue wall does, meaning that the whole room will look brighter… and that’s really the point. I owe a couple of baby gifts. This week I’m tackling a quilt for a baby boy, and I’ll be creating a pattern so that I spend less time measuring and cutting for future quilts. It should only take a few hours to make, so unless I go into labour this week you can expect to see the finished product in next week’s post. And that’s all, folks. Feel free to join WIP Wednesday. You can find all the information right here.